*Note from SdS: the following is an account based on Sameera’s experience. I’ve come to think of this mysterious tusker as ‘Ghost’ because we so rarely see him and know so little about him. The name has stuck in my head, so that’s going to be his nickname from now on. It was about 2 o’clock in the morning when I woke up to the sound of something brushing past the pipes outside. It was near the water tank. 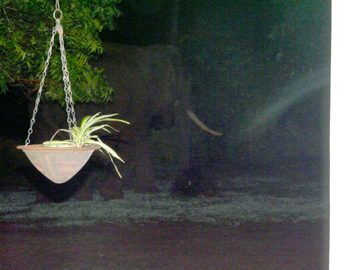 As I listened harder, I began to make out a distinctive sound – an elephant eating. Walking over to the window, I could just make out the dark bulk of a big male. I was by myself in the field station, sleepy and tired, but very quickly I became alert. Our housekeeper, who usually sleeps on a bed on the porch, had gone home for the weekend. I was glad about this because I thought he surely would have turned on the lights and scared off our visitor. Tusker “209” which seems to have been translocated into Uda Walawe National Park in early 2010. 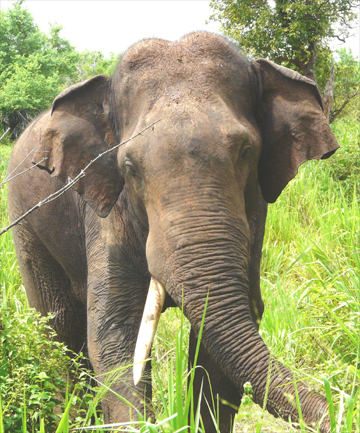 For months we had seen and heard evidence of elephants breaking through the electric fence, but despite numerous attempts they were impossible to find and track down once they got into the sugar cane across the road. There were at least four elephants responsible, people thought. At least one of them was a one-tusked male. We suspected it was an animal that had been translocated into the park last year, but had not been able to verify this. This was an important chance to catch one of the culprits in the act. I grabbed the video camera and went quietly around to the back door, from which I had a good view of him. It was the tusker himself! His single white tusk gleamed in the dark. He was very casually mowing down all the manioc and bananas planted along our barbed wire fence, which he eventually broke through without the least concern. I managed to catch some of this on film but it was too dark to get clear photos. 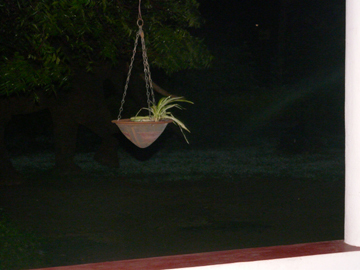 …to munch on the mango tree. Tensely, I finally decided it was time to chase him off before he made a complete mess. I flipped on the lights and yelled, heart thumping. 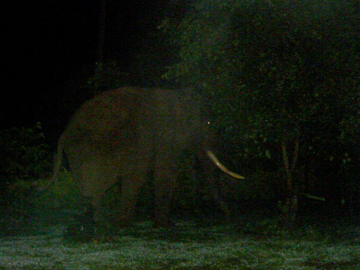 The elephant was relatively unfazed by this commotion – he must have been very used to it by now. But he did amble off and disappeared back into the cane fields. Thinking that was the end of it, I tried to go back to sleep. – it was indeed the same tusker. He had merely taken a stroll in the sugar cane until the coast was clear and circled right back. He had gone through another section of fence, and was headed for our mango tree, where he smoothly munched on most of the fruit within reach. This time I managed to get some photos before he left. 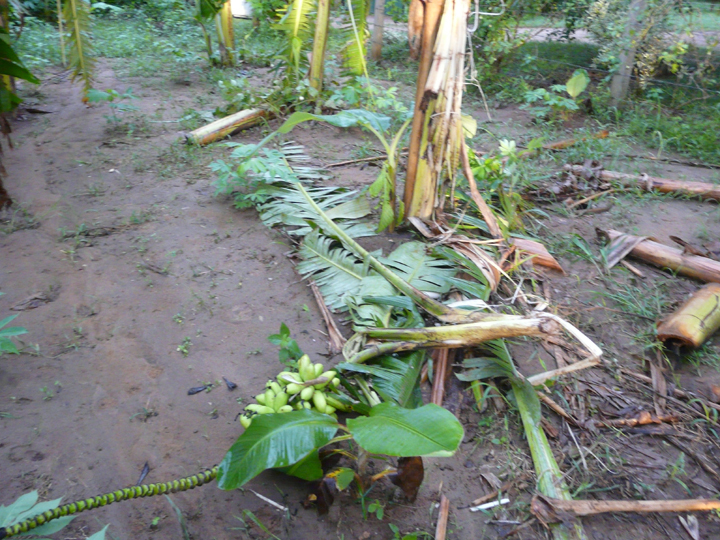 In the morning I inspected the damage – banana trees knocked over, manioc tubers uprooted. Pretty typical. 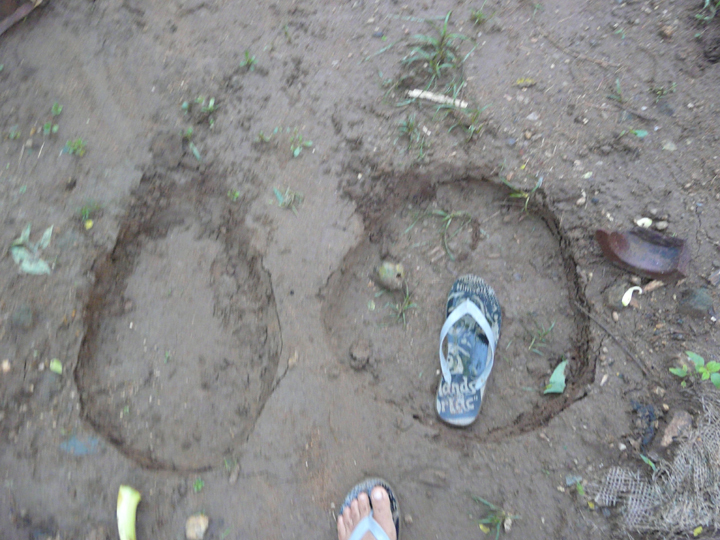 But as a bonus there was a nice set of footprints and even some dung, both very valuable gifts to us – the tracks would let us measure his size and the dung might let us get some DNA. The field station has only a few plants in its home garden, ones that we do not rely on for subsistence. It’s easy to imagine how a farmer feels when it’s his very livelihood and life at stake. Ghosts don’t leave tracks, but this one did. ← Join The Elephant March – Say NO To Ivory! Thanks Namal. 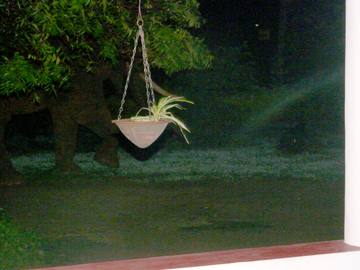 We got a similar report earlier this month so it appears Ghost has made himself at home in Udawalawe. would you know where it was relocated from? We don’t know that unfortunately.